Janus emulsions, containing olive oil (OO) and silicone oil (SiO), were formed in presence of polyelectrolyte complex particles, i.e., gelatin-sodium polyacrylate (NaPAA) complexes. 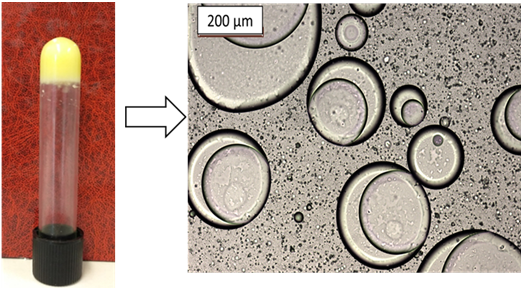 The diameter of completely engulfed Janus droplets can be tuned between 50 and 200 μm by varying the gelatin/NaPAA complex particle size between 200 and 400 nm. The gelatin/NaPAA complex particles adsorbed at the olive oil interface decrease the interfacial tension and stabilize the resulting completely engulfed Pickering Janus emulsions. Long-term stable Janus gels can be synthesized in presence of gelatin/sodium carboxymethylcellulose (NaCMC) mixtures. In that case Coulombic forces are of relevance with regard to the stabilization of the Janus droplets embedded in a gelatin/NaCMC gel matrix. Janus gels show elastic reological behavior and thixotropic properties.